Pushpa Kapila Hingorani, the lady behind many movements;one of the first legal luminaries of India;a pioneer in the use of public interest litigation on behalf of women’s movements; an indefatigable and militant advocate for women’s rights, took her last breath today morning. 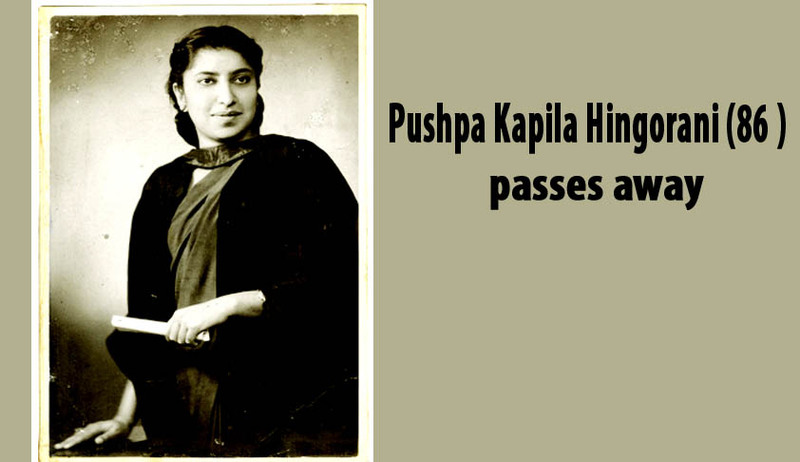 Pushpa Kapila attended the University College Cardiff in 1947 to study English, Economics and History before embarking on her pioneering work as a lawyer in India. But her journey to a UK University was not an easy one. ‘I was born in a community where the question of girls going abroad was not even considered. My mother thought I should get married and settle down, but, my father, a social reformer, who was educated himself, encouraged me to apply to Cardiff’, she once said. At one time, Hingorani had petitioned on behalf of 11 victims of dowry cases registered with the police. The fight culminated in the court directing the setting up of special police cells to deal exclusively with crimes against women. She also fought for the prohibition of the devadasi practice in Karnataka in 1983, setting up family courts in India and was a spokesperson for the aamjantaof Bharat. In a landmark case which saw the emergence of Public Interest Litigation in India, later known to every law student in India as Hussainara Khatoon case, was the first PIL in India. 31 years hence, she cascaded the apex courts with PILs. "The success of the Khatoon case was so widespread that the Supreme Court in the 1980s opened a new section in the Registry devoted to PILs. Officers used to sift through the incessant bombardment of letters or petitions from citizenseveryday and choose the ones which should be brought to the court's attention," Hingorani had said. She worked extensively in areas as diverse as human rights and Constitution. Her career involved fighting nearly a 100 cases, many of them dealing with police torture, dowry crimes, gender discrimination and child labour, that brought relief to millions. She was restless with a spirit which never lacked motivation. After a successful career, when askedwhether she is looking forward to retirement, she had famously said, ‘Lawyers never retire! I will continue my work in Public Interest Litigation and have yet to finish my book on this subject’. And as she said, her work never retired for the movements she led and the causes she mothered.